Numskull, 'Killer Zombies of Surry', 2007. Photo: TC. What happens when art is viewed totally out of context? The answer can be seen across Australia over the next two years as the exhibition, MAY’S: The May Lane Street Art Project, tours regional galleries. MAY’S is a street art project, spawned in inner city Sydney and championed by Tugi Balog, owner of Graphic Art Mount, a picture framing business. For more than a decade, Balog has been giving street artists a legal space to express themselves using the walls of his building as an outdoor exhibition space. In 2005, he started inviting the artists to also paint removable panels, 27 of which have now been brought in off the street and into the gallery. And not just any gallery. The show kicked off its tour at Bathurst Regional Art Gallery, just about as far from the gritty inner city as you can get. 'MAY’S: The May Lane Street Art Project' installed at Bathurst Regional Art Gallery. Photo: TC. By removing the art from its native habitat it becomes something else. What seems very ordinary and almost invisible in the big cities (a kind of urban wallpaper) becomes exotic. It challenges preconceptions of what art is (or should be) and where it belongs. And preconceptions also extend to the artists. The MAY’S artists are an eclectic bunch. They range in age from 20-something to 50+. Some learned their trade on the streets (as you’d expect), but others were art/design school trained. And several are widely collected by respectable art world institutions. Many of the artists went to the opening at Bathurst, but only one guy seemed to fit the pre-conceived mould of what a street artist should look like. I watched several locals go up to this big, tough looking bloke to ask him about the work, only to be told over and over that he was just there with his girlfriend. She was the street artist. Of course preconceptions are not the exclusive preserve of regional Australians. I’d never been to Bathurst, and having previewed MAY’S: The May Lane Street Art Project (The Post Post may not do previews, but most publications do) I was keen to see both in person. Neither the show nor the city were quite what I expected. Sometimes it takes a literal move to make space for looking at art (and artists) in a different way. By moving street art out of its context, MAY’S opens up the possibility for a shift in perceptions, or at least a conversation. 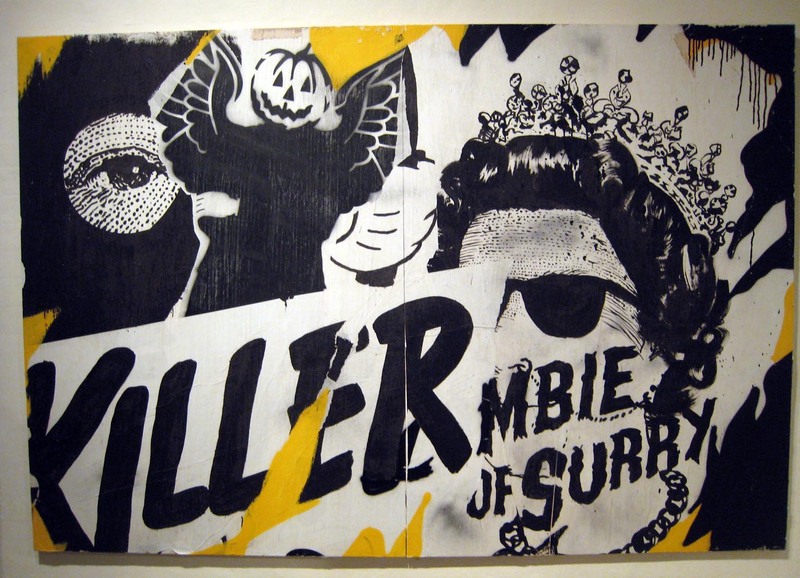 MAY’S: The May Lane Street Art Project is on at the Bathurst Regional Art Gallery, until November 28, 2010. Mini Graff, 'Suburban Roadhouse No. 5', 2010. Artspace, Mackay, Qld, 11 March -1 May 2011. Samstag Museum of Art, Adelaide, SA, 13 May – 1 July 2011. Lake Macquarie City Art Gallery, Lake Macquarie, NSW, 29 July -11 September 2011. 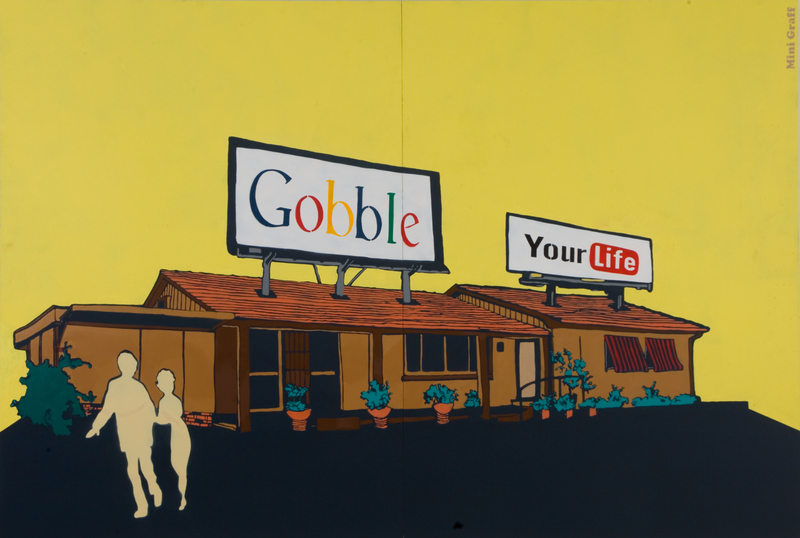 Belconnen Arts Centre, Belconnen, ACT, 24 September – 22 October 2011. Cockatoo Island, Sydney, NSW, November – December 2011 (TBC). 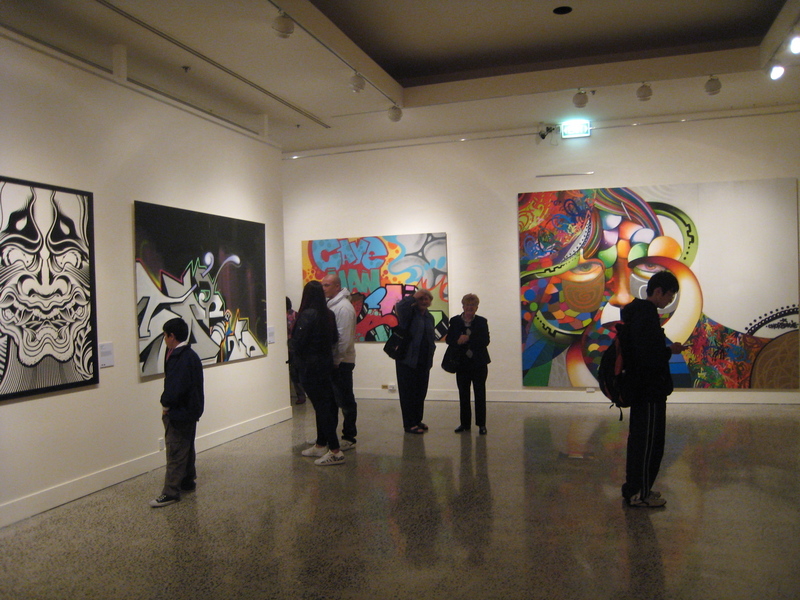 Gosford Regional Gallery, East Gosford, NSW, 4 February – 1 April 2012.